Give visitors to your website the scoop—without making them dig for the story—by creating an online press room. 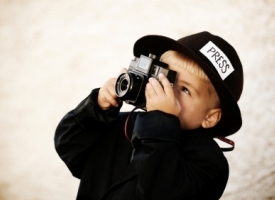 More than just a place for press releases, your online press room is where journalists, investors, and customers pop in to get the word on your company and business. Stock it with fresh, vibrant copy—not to mention images and other media—and your online press room will drive exposure, and potentially even sales, for your organization. In this Take 10, Michael Miller, author of The Ultimate Web Marketing Guide, gives you the skinny on how to create an online press room that generates publicity and new business. Learn what to include, how to promote it, and give investors and the press easy access to the news they're looking for. Michael Miller is the author of more than 100 non-fiction books published in the past two decades. Collectively, his books have sold more than one million copies worldwide. His best-selling titles include YouTube for Business (Que, 2008), Teach Yourself YouTube in 10 Minutes (Sams, 2009), Online Marketing Heroes (Wiley, 2008), and The Complete Idiot's Guide to Search Engine Optimization (Alpha Books, 2009). Michael worked almost 20 years in retail and corporate marketing environments before switching to writing full time in 1999. Throughout his career, Michael has established a reputation for practical advice, technical accuracy, and an unerring empathy for the needs of his readers.